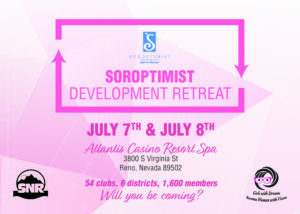 The 2019 Soroptimist Development Retreat is in the planning stages now! Here’s your Save the Date for July 27-28, 2019! Governor Lane welcomed us and spoke about the history of the Soroptimist Development Retreat, the new SNR Board of Directors performed a skit about Soroptimist through the decades and SIA President Dawn Marie Lemonds gave us a wonderful talk about Heroines in the Making. Our Keynote Speaker, Carolyn Carver, spoke about Communicating Across Generations on Saturday, and followed that up on Sunday with a presentation about Embracing Change. Learn more about Carolyn at her website. The weekend was fun, inspiring and very educational! Gotta see what you missed? Get your Program, Cut The Deck Flyer and Thank You Sponsors handouts. 2:45 – Team Work makes the Dream Work! 4:00 – Engaging New Members! 4:00 – Quick and Easy Fundraising So much more on the Fundraising Ideas page! 4:00 – Maximizing the Dream Programs – What is the next step? 9:00 – Woman Speak – Turning your fear of speaking into POWER! 9:00 – Mind, Body & Spirit Yoga for You!